There are five unique considerations when growing giant pumpkins. These differ slightly from methods used to grow traditional pumpkins. Seed selection is very important when growing giant pumpkins. You can't grow the big ones unless you choose seed varieties that are capable of producing monsters. 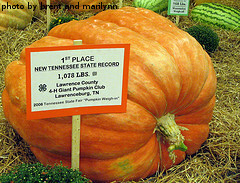 Some common giant pumpkin varieties are Atlantic Giant, Big Max, Big Moon, Mammoth Gold and Prizewinner. When choosing a location to grow massive pumpkins, remember that you need a bunch of space with as much sunlight as possible. Plant the pumpkin seeds in very large hills or mounds that measure 6-8 feet across and 15"-18" high. These mounds should be spaced at least 20 feet away from any other plants in your garden, including other pumpkin plants. When constructing the mounds, mix together equal parts of soil and compost. Also remember that giant pumpkins take 115-130 days from planting to harvest. It's best to plant the seeds as soon as possible after the last expected frost in your area. Each pumpkin vine has two types of flowers, male and female, that usually appear in late June or early July, depending on when the seeds were planted. The male flowers are used to pollinate the female flowers. When growing regular sized pumpkins, you can leave the pollination work to bees. However, when growing giant pumpkins, you need to pollinate the female flowers by hand. The female flowers are easy to identify as they show up after the male flowers. 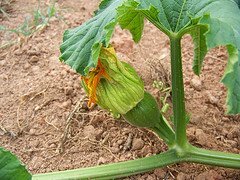 Female flowers appear close to the vine and sit on tiny, green, baby pumpkins. Male flowers appear first and are located on long, thin stems, further away from the vine. There are always many more male flowers than female flowers. Pinch off any female flowers that appear before the vine reaches 10 feet in length. A big, strong vine is needed to produce a giant pumpkin. If you don't pinch off early appearing female flowers, the plant will put valuable energy into fruit development rather than vine development. You will end up with a nice pumpkin that's far less than a giant. Once the vine is long enough, wait for a female flower to develop. Once the female flower opens, you're ready to pollinate it. Pick a fresh male flower. Using a small paint brush, gather the pollen from the stamen of the male flower and rub it into the center of the female flower. After pollination, cover the female flower with some cheesecloth and secure it around the stem with a rubber band. This will keep insects from pollinating the female flower. At this point, you wouldn't want to chance that a bee might pollinate your female flower with pollen from a non-giant pumpkin variety. Giant pumpkin vines will usually have 100+ leaves. Each of these leaves is responsible for providing nutrients that will support the growth of a giant pumpkin. A key to this nutrient production is watering. During dry periods in the summer, you should be giving your giant pumpkin plants 15-20 gallons of water every 3-4 days. Make sure to keep the leaves dry and concentrate your watering efforts at the roots of the plant. This will reduce the chances of disease development. An inch of rainfall is equivalent to about 25 gallons of water. So keep tabs on the amount of rain you get in any given week, as that will determine how much watering you need to do. Pruning is very important when growing giant pumpkins. You want to limit each vine to producing only 1 pumpkin. Therefore, you'll need to remove other fruit so that the plant can pour all of its efforts into nurturing a single monster. 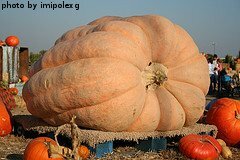 A giant pumpkin plant may produce 3-4 pumpkins if left to its own devices. Once 2-3 fruits on a single vine have reached the size of baseball, remove all but the best looking one. After the main vine has reached 20-25 feet long, it's time to prune the plant. Pinch off the tips of the primary vine and the side shoots. Also pinch off any remaining female flowers that may have appeared. From now on, you want the vine to grow as big and strong as possible and pour all of its energy and resources into producing a single, monster-sized pumpkin.